Do you need to encrypt your PHP scripts or code before distribution? Are you looking for an affordable and clever solution? Protect your PHP Scripts before you deploy them! 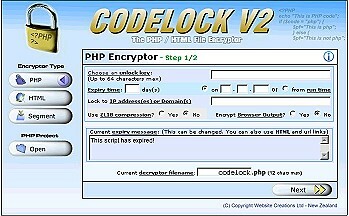 The Encryptor software works with any install of PHP4.x or better. Requires no additional software to be installed (on your server or on your clients server) - Codelock V2.7 is ISP friendly! Unlimited license. Pay for it once, use it as much as you like on any of your scripts - forever! ENGINE Mode - Now you can call the Codelock V2.7 encryptor engine as a file 'include' and encrypt your files invisibly! Simply pass through the required paramaters, and tap into the Codelock V2.7 engine to encrypt your files on the fly! Yes, in real-time... and online! 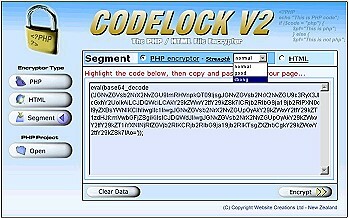 Codelock V2.7 uses a unique "key" encryption method to encrypt your pages. Along with proven as well as unique encryption algorithms, Codelock V2.7 offers ultimately stronger security for your data. Without an unlock key, your code is virtually indecipherable and untouchable. 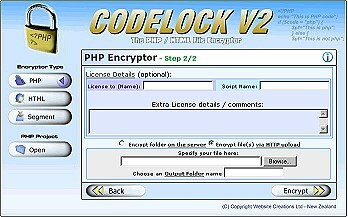 Codelock V2.7 offers you the best user-friendly encryption power without being complicated. Your scripts can be easily exported and executed by end-users without any modifications to their server. 4. Send / Run your PHP page(s) safely! For a simple and affordable solution click here to purchase, or click here for more information.